Some parts of rural China are slowly experimenting with increasing forms of democracy within local government. In most places with a population of more than 2,000, a handful of voices against such a proposal may have gone unheard. 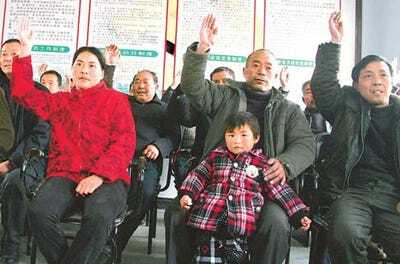 Not in Heilong, where residents have been given a far greater say on village affairs thanks to historic measures rolled out in rural areas across Dengzhou county, Henan province. It meant Zhang and a dozen others were able to veto the project during a villagers’ meeting. Instead, only residents who directly benefited from the new roads had to pay. “For the first time, our opinions mattered,” said the 60-year-old, who heads a family of 10, including several grandchildren. The democratic experiment in Dengzhou, a large farming area in China’s most populous province, symbolizes both the spontaneous grassroots efforts to boost democracy in the countryside and the challenges they face. The groundbreaking measures, which have been in place since 2005, are the brainchild of Liu Chaorui, the county’s Party chief, and are based on the belief that consensus – the basis of stability – can only be achieved through compromise. It’s an enormous country, thus there are many different places where different ideas can take root.